The Texas A&M AgriLife Research and Extension Center (A&M; College Station) announced in March plans to open a new building complex demonstrating green infrastructure and stormwater reuse on its North Dallas campus for public tours later in 2019. The 2.8-ha (7-ac) Benny J. Simpson Ecopark and Water Education Building also will become home to A&M’s Water University program, which cultivates a statewide network of partners to advance water-sector innovation in Texas. Texas A&M AgriLife Research and Extension Center (A&M; College Park) announced plans to open its new Benny J. Simpson Ecopark and Water Education Building to the public for tours later this year. 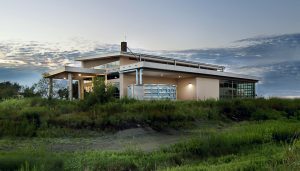 The 929-m2 (10,000-ft2) Water Education Building features innovative stormwater reuse systems and will serve as a hub for locals, industry professionals, and government representatives to learn more about the latest in stormwater management. Gabe Saldana/Texas A&M AgriLife Research and Extension Center. 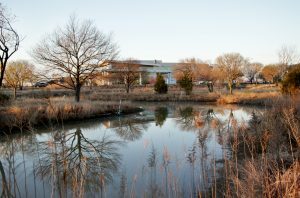 The Ecopark is constructed around a 1.2-ha (3-ac) rainwater detention pond designed for the space by members of A&M’s ecological engineering program. The park features more than 140 plant species native to Texas. About 1.6 ha (4 ac) of restored Blackland prairie habitat within the park – formerly used for agricultural research – now provide stormwater mitigation benefits for one of Texas’ most densely populated areas to reduce pollutants entering nearby White Rock Creek. A&M’s adjacent, 929-m2 (10,000-ft2) Water Education Building will serve as both a teaching and demonstration space. Outside the facility, a 113,500-L (30,000-gal) cistern captures rainwater, which becomes the only water source used for the building’s restrooms, in addition to sustaining the surrounding landscape. Overflow from the cistern feeds a nearby retention pond, outfitted with native plants and erosion-control fabric, which helps minimize sedimentation and keep pollutants out of the watershed. Inside, A&M staff will instruct members of the public, environmental professionals, and government representatives on how to implement similar conservation practices, according to the A&M website. signage that outlines green infrastructure concepts, highlights native plant species at work, and points out important wildlife that the complex supports, such as great horned owls and monarch butterflies. The complex was named to honor Dallas horticulturist Benny J. Simpson, who served on A&M’s research staff for more than 40 years and was known as an authority on Texas ecology. A&M staff relocated 50 historic trees throughout the Ecopark that were originally planted by Simpson. Gabe Saldana/Texas A&M AgriLife Research and Extension Center. A&M staff named the project to honor Benny J. Simpson, a horticulturist and Dallas native who died in 1996 after more than 40 years as an AgriLife Center researcher. A strong proponent of using natural solutions to address complex problems such as stormwater management, Simpson wrote A Field Guide to Texas Trees in 1988, today considered a seminal work on Texas’ unique ecology. Included among the Ecopark’s landscape are 50 historic trees originally planted by Simpson himself.